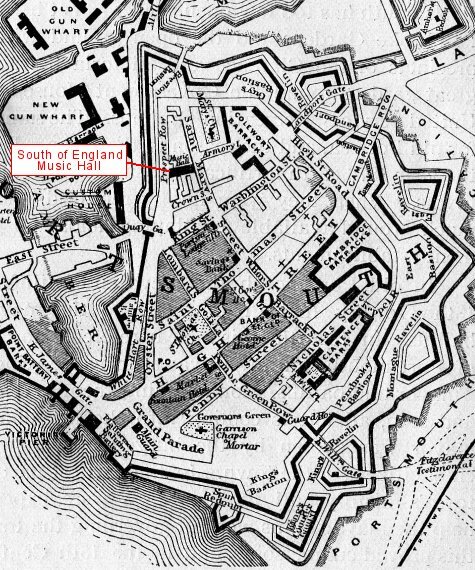 Trumpeted as a "True Temple of Harmony" the South of England Music Hall proclaimed its presence in St Mary-street, Portsmouth on 14 April 1855. Now "permanently enlarged" it seems that entertainment may have been presented earlier at the rear of the Blue Bell Tavern, perhaps beneath a tented structure. The grandiose title reveals the ambition of the proprietor, William Brown. A true Victorian entrepreneur, styled on his billboards as "from London" when he came from a humbler Kingston-on-Thames, Brown was going to give the locals something that could only be got previously in the largest capital city in the world. Accommodating upwards of two thousand persons the venture was ambitious. With "chaste and elegant Decorations...by that Eminent Artiste, Mr. G. B. Wilson" and "numerous Glass Chandeliers...by the celebrated Makers Defries and Sons, of London", Brown was determined that money would buy prestige. But as success came so did the problems. Situated as the Music Hall was on a very narrow street the lines of cabs waiting outside caused great nuisance, blocking the street to other traffic. And as many of these cabs were said to be "ordered" by "a certain class of women who were generally found at the bar", authorities were invoked and bad publicity appeared in the press. An article of 1858 refers to the Hall as a "low den" and the "numerous bad characters" attracted by "nightly concerts". In 1861 a drunken sailor leapt from the gallery bringing down one of the chandeliers and the same year the Hampshire Telegraph delighted in telling of an assault in the street by John Blanchard, "the admired comic vocalist" at the Hall, upon a fellow artiste, Maria McFarlane, "Irish characteristic and serio-comic vocalist". Negative publicity apart, William Brown’s vision of a venue to rival any in or outside of London appears to have succeeded. On Wednesday 25 April 1866, three thousand shares were offered at ten pounds each in the newly formed South of England Music Hall Co. Ltd. The five directors, of whom H Hollingsworth of the Portsmouth Floating Bridge Company was one, evidently saw a great future for the company. Hoping to provide a "higher class of entertainment" with "increased accommodation"... "attracting even larger audiences" the promotion drew attention to the "increasing population" of Portsmouth and surrounding towns with "the notorious lack of public amusement". The Music Hall continued to flourish and attract leading artistes of the day. Blondin, "Hero of Niagara" appeared several times. His walked a rope the length of the hall at a height limited only by that of the building, (about forty feet). He offered to carry any gentleman across the rope on his back for a fee of one guinea – and there were takers! William Brown "disposed" of the property to the Alhambra Music Hall Company in November 1873. It is unclear what happened with the former Limited Company but the new sole proprietor Henry C Hughes was an entrepreneur with several theatres under his management. He spent lavishly on the South of England Music Hall and it flourished under his control until the fateful fire on the night of 12 September 1878. Hughes had, "at enormous expense" just engaged "Champagne Charley", George Leybourne, to appear at the Hall when disaster struck. Beginning in an adjoining soap manufactory a fire spread which, despite the heroic efforts of staff and soldiers of the local garrison, reduced the Hall to ashes. But not to be defeated by October of 1878 Hughes had submitted new plans to the council and was busily rebuilding. By March the new Hall was almost finished. Enlarged by taking over the land of the former soap works, the new building had eight access points, six hydrants and its own fireman. But it was all in vain. The papers reported on 02 October 1879 that the largest Music Hall outside of London was again destroyed by fire. The only asset to survive the South of England Music Hall was its Wine and Spirit License which was transferred to the new owners of the site: The Portsmouth Empire Palace Co Ltd. The land was sold on and 27 October 1892 saw the laying of the foundation stone for the Central Electric Lighting Station.